(Newser) – Yemen's al-Qaeda branch announced today via Twitter that its top cleric, a Saudi national who has had a $5 million bounty on his head, has been killed. Ibrahim al-Rubaish was killed, along with other, unnamed members of the group, allegedly by a drone late Sunday. The statement didn't specify the location of the drone attack. Yemeni and US officials had no immediate comment. 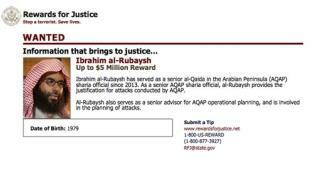 Al-Rubaish, believed to be in his late 30s, was released from Guantanamo Bay in 2006, after which he joined al-Qaeda in Yemen. He was considered the group's main ideologue and theological adviser, and his writings and sermons were prominent in its publications. Couldn't have happened to a nicer guy. Next. Feds update 'no fly' list so suspected terrorists can learn why they were denied boarding a flight The Obama administration will soon tell suspected terrorists if and why they are on the federal government’s so-called “no-fly” list. Travelers who have been refused access to a commercial airliner either in or out of the United States can petition the government to learn whether they are on the list. And they can petition a second time for an unclassified explanation on why they are on the list. The Justice Department will file a notice Tuesday in federal court detailing the updates to the federal inquiry program. Homeland Security Department spokesperson Marsha Catron said earlier that the federal government is “committed to ensuring the safety and security of the traveling public, while continuing to safeguard the privacy and civil liberties of all Americans.” -------------------------------------------------------------------------------------------------------------- The suspected terrorists are Americans ?